To help you find the Best Guitar Lessons, TopConsumerReviews.com provides you with an in-depth comparison of True Fire and Guitar Tricks. 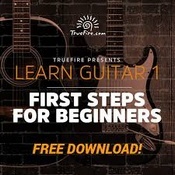 The True Fire guitar lesson system is a library of 700+ courses with over 33,000 lessons. It includes over 11,000 tabs and notations and 7,000+ jam tracks for all styles and all skill levels. You’ll learn from a roster of over 140 guitar music educators who are grammy-winning, professional recording artists, music school professors, and world-class instructors. You can craft your own study course by pulling together lessons from all over the website or app to fit your goals and interests. The interactive lesson player shows multi-view video angles, playback controls, video looping, slow motion, a tuner, a metronome, and other useful controls. You can also access text narrative, standard notation, tablature, guitar pro tab and practice rhythms. You can access course content via website tabs containing whole courses, learning paths (genres), private lessons (list of instructors), and jams (In the Jam videos with featured artists, individual jam tracks, and premium jam packs). True Fire publishes its learning software on Windows and Mac PC operating systems as well as on the Apple App Store and the Google Play store. Course content can be purchased a la carte or via subscription via an all access pass. In general, the browsing and purchasing experience feels a little nickel-and-dime-y but the all access pass can alleviate that problem. It also helps that you’re given $10 in “TrueFire Cash” to buy a lesson with. Every time you purchase something on TrueFire, you get a rebate of a certain amount of True Fire Cash that can be used for up to 25% off any course and many other items. Learning Paths are a nice way to start by following a path through very basic concepts and techniques all the way up to more advanced abilities and skills. Tracking progress is done via a dropdown under a course video and you can mark your favorite videos to come back to later or add them to a playlist. Another really neat feature is the SoundSlice technology which displays the music notation below the video in the exact moment as its notes are being played in the video above. That makes it super easy to follow along in the lesson with the music. And it’s easy to select a section of a video via a waveform display to loop it so you can go over a chord, section, or concept multiple times. Overall, with True Fire there are so many videos, varieties and fantastic instructors, plus a ton of really great learning features. And, it’s all online rather than just on DVD. The site appears to be frequently updated and it has downloadable learning software to put on your Windows or Mac PC, or your iOS or Android device and go mobile. We give True Fire our highest rating.